Champion of the Parish. (c) 2013 Wizards of the Coast. This past weekend we saw what the Standard metagame looks like after the Pro Tour, at Grand Prix Quebec. A few new successful decks have emerged as options to play in Standard. There are many cards that normally I would be very keen on acquiring based on those decklists, but I feel I should temper my enthusiasm on the cards that happen to be in the preconstructed Gatecrash Event Decks. Woodland Cemetery was the hot land as Return to Ravnica was nearing its release date. Everyone wanted to play Golgari, which resulted in that land outpacing its brethren in price. However, shortly after the November release of the Return to Ravnica event deck, Woodland Cemetery plummeted in price; it kept on falling, and it’s only been in the last month that it’s stabilized at around $9. Thragtusk, on the other hand, is a card that proves that being printed in an event deck is not the death knell for its price. Indeed, this card was actually printed in two event decks (M13’s Repeat Performance, along with Ravnica’s Creep and Conquer), and still held steady at $25 until recently. It wasn’t until Thragtusk was reprinted yet again in a third event deck (Gatecrash’s Thrive and Thrash), that its price fell to its current $15. However, I attribute its resilient price to the factors that it was just that dominant in Standard at the time, along with not as many M13 packs being opened compared to other non-base sets. Now, with all that information in mind, let’s take a look at a couple of cards that did well over the weekend, but were also printed in a Gatecrash Event Deck. Based on the results from both last weekend, and at the Pro Tour, Champion of the Parish is normally a card I would really want to buy. It was a 4-of in the winning decklist at the pro-tour, and now it also won GP Quebec in a completely different decklist, along with three total decks in that top-8 playing them. Clearly, this is an extremely important card in an aggressive aggro deck. In addition, this is near the end of when you can buy Innistrad block cards cheaply, as people are going to start looking for cards from those sets as the Standard PTQ season is approaching very soon. However, I’m a little hesitant to buy in, as even if store are charging more than msrp for those event decks, it’s undeniable that there will be more copies of those cards floating around. Champion is still cheap enough that I may trade for a few copies, but I doubt it will define the format as Thragtusk did, so I don’t think it has a very high ceiling. Silverblade Paladin is in a similar situation as Champion of the Parish; it appears in the same Event Deck, and is also usually found in the same Standard decks as well. 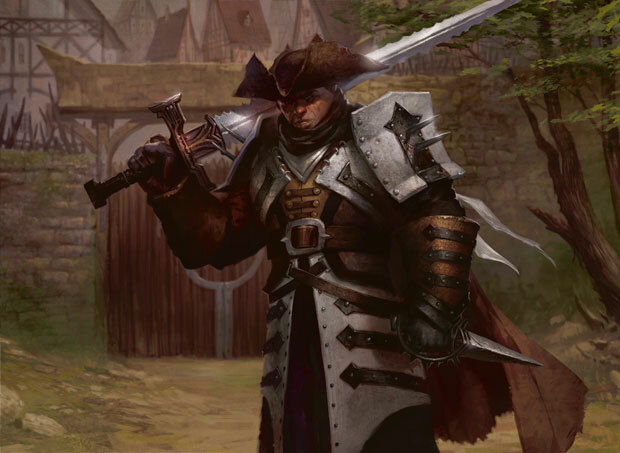 Silverblade Paladin has more casual appeal, as it is the flashier card that can lead to easy blowout wins, but Champion of the Parish is the card that is always played as a 4-of in tournament decks. One card I would invest in based on this past weekend is Lotleth Troll. Did you know this card has fallen all the way to $2?! This card has just made the top-8 of a GP, and it has historical precedence of doing well too, as it made the top-8 of multiple SCG opens before R/B Zombies became the popular choice. This is still a very strong card that has many relevant abilities, that has simply been searching for a home. I would pick them up now before they find a popular one.